OneLogin is an identity and access management provider that enables frictionless login for enterprise apps. Using OneLogin, your agents can log in securely without using a password. a. Log in to your OneLogin account. b. On the menu bar, go to Apps-->Add Apps (or) click on 'Add App' button located in the top right corner of the login screen. c. Search for 'HappyFox Chat' in the search bar and select 'HappyFox Chat' app. d. Now Click 'Save' button in the top right corner. e. Go to 'More actions' >> click 'SAML Metadata' which will generate an XML file. f. Copy the data from the downloaded XML file. 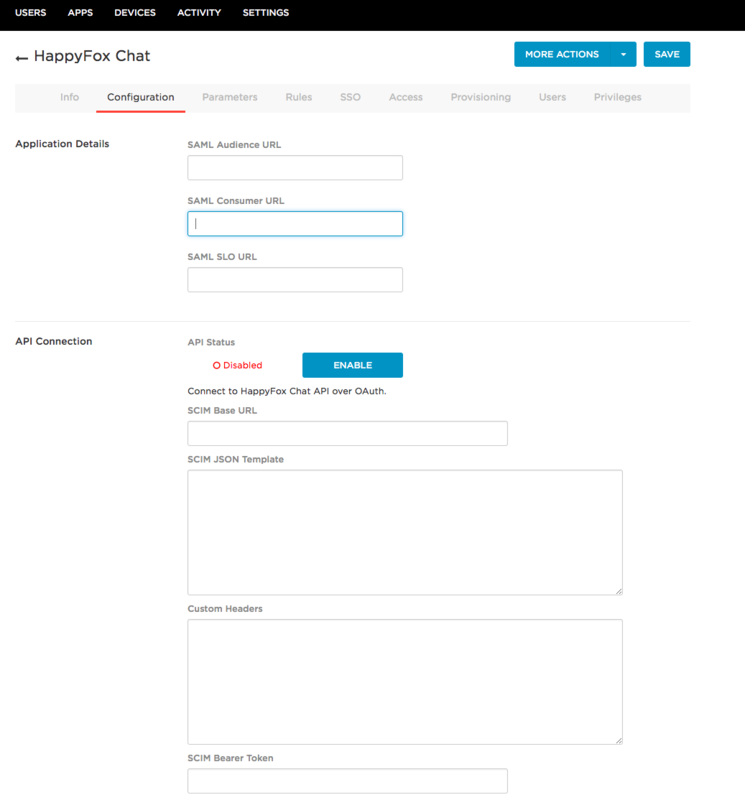 e. Go to Manage section on HappyFox Chat >> Click Security >> paste the data into OneLogin metadata field and hit 'Save' button. a. 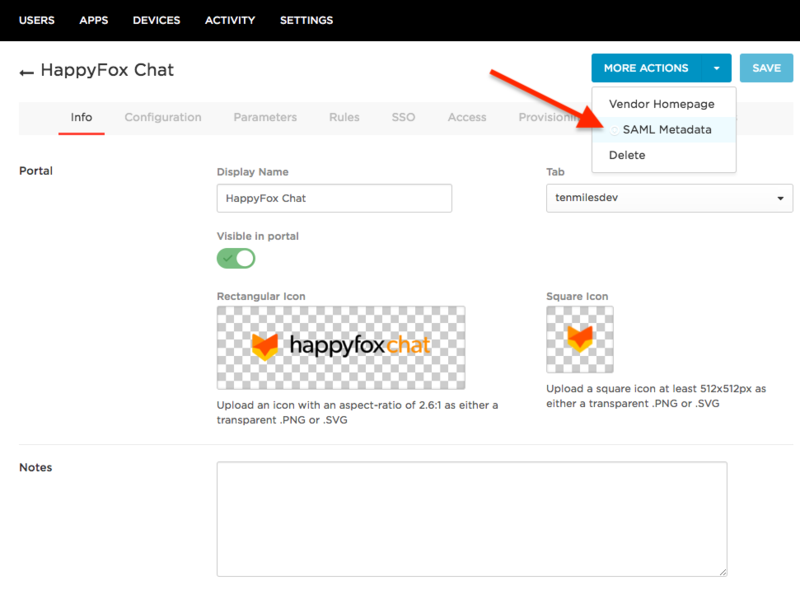 After the metadata is saved, SAML configuration settings will be shown in your HappyFox Chat account. b. 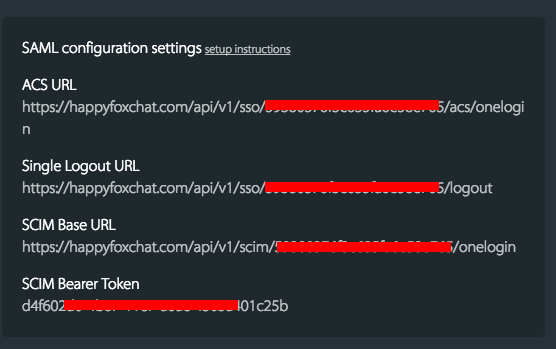 Copy the ACS URL, Single Logout URL, SCIM Base URL, SCIM Bearer Token from your HappyFox Chat account. c. Paste these URLs into the respective fields under Configuration tab of your OneLogin account. d. Now click on 'Enable' button against API Connection (refer the image above) and hit 'Save' button. 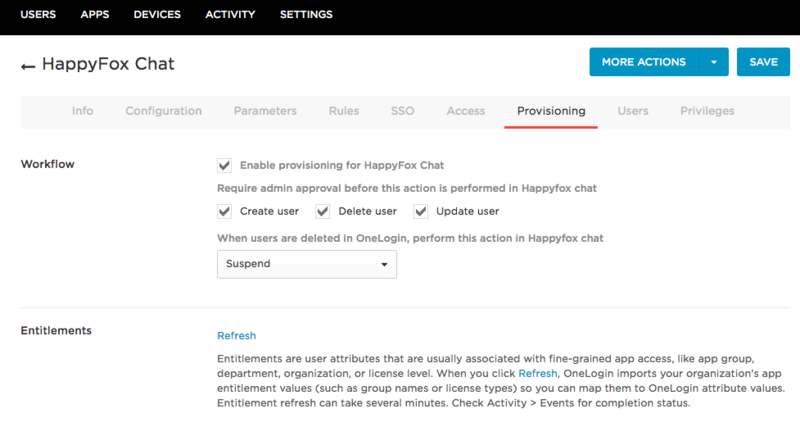 e. If you want to enable workflows for HappyFox Chat account, go to Provisioning tab, select the checkbox against Enable provisioning for HappyFox Chat and hit 'Save' button. All the settings related to SAML Configuration are done. 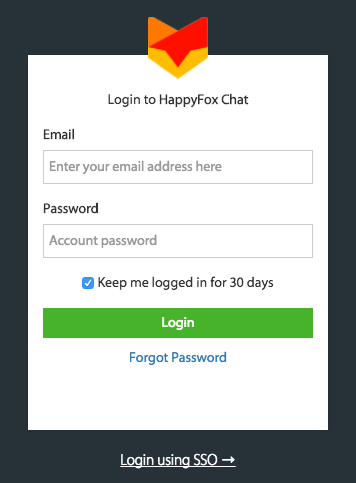 a. Log in to HappyFox Chat. b. Click on 'Login using SSO' hyperlink below the login form. 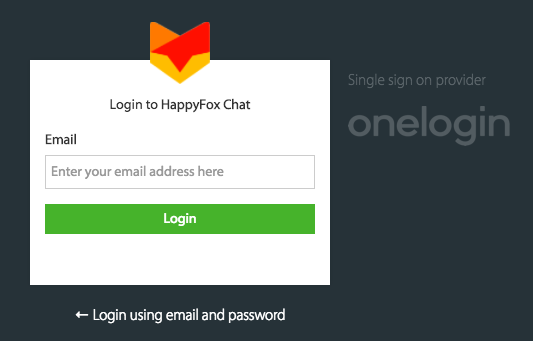 c. In the next page enter your email address and click 'Login' button to log in to your HappyFox Chat account directly. 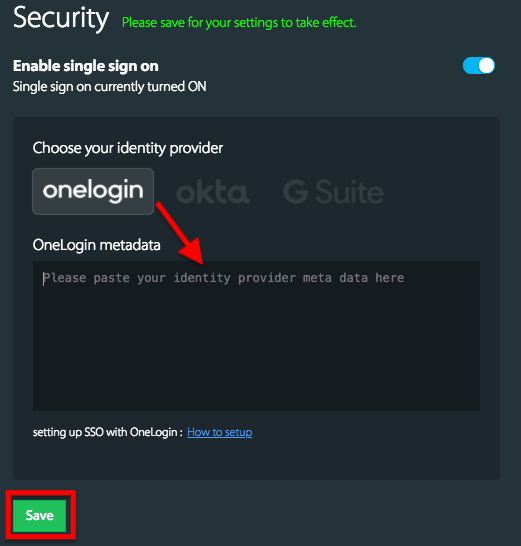 Note: Make sure that you're logged into your OneLogin account while doing this. 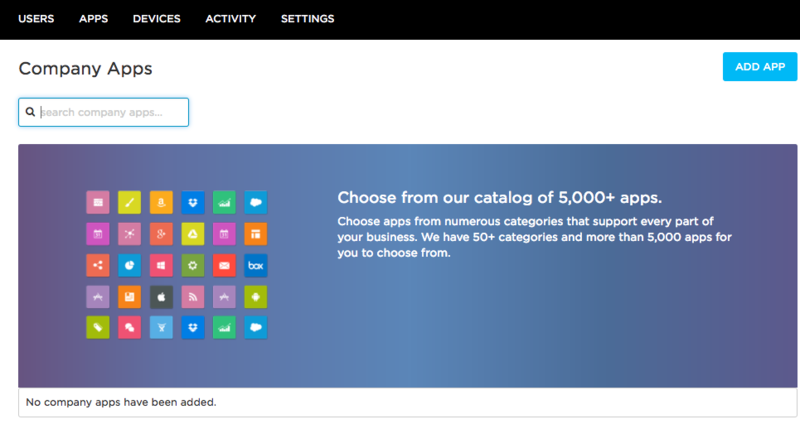 If you're not logged into your OneLogin account, you will be prompted to log in to your OneLogin account first.